Perfect for large groups, with great outdoor amenities and views! Buffalo Lodge from across the pond. Entrance to the lodge Approaching the front Front of the lodge Great Room angle 1 Great Room angle 2 Master Bedroom Master Bathroom Guest Bedroom 1 Guest Bedroom 2 Guest Bedroom 3 Guest Bathroom 1 Large walk-in shower, perfect for hosing off a group of kids Sleeping Loft angle 1 Sleeping Loft angle 2 Sleeping Loft angle 3 Sleeping Loft angle 4 Playhouse in the loft French doors lead out of the living room to a furnished patio looking over the creek. Patio over-looking Bennett Creek. Grill your favorite summer meals on the patio Patio, foot bridge, and Bennett creek. Bennett Creek Private pond The pond is perfect for small boats, floats, swimming, or just dipping your feet. Buy a license at the nearby Edelweiss and fish right on the property This playground is right next to Buffalo Lodge and the creek. Panoramic moutain views Great views abound and the property is very private. Welcome to the Buffalo Lodge! This large "shop" home is situated on a private 16-acre parcel in Clark, Wyoming. There is room for parking an RV (no hook-ups) and cars. The lodge is ideal for 10 guests but has room for more at an additional cost. Experience the joy of Bennett creek and the small pond, both perfect for cooling off in the summer heat. Bennett creek is slow moving but fast enough to float down on inner-tubes, wade, or even fish. The pond is great for swimming, fishing, floating, or just dipping your feet in to cool off. Just off the patio is a shallow area perfect for younger children to sit in the water and play. There is also a small playground and sand pit. Bring your horses for an additional fee and ride on the property or explore the many trails to the east and west. The lodge features an open floor plan for the kitchen, dining and living room. French doors lead off the living room to the patio. There are four bedrooms and three baths on the main floor. The upstairs has additional sleeping arrangements, another bathroom, and plenty of floor space for the less-discerning guest with a sleeping bag. One end of the home is a large bay with cement floor and collapsible tables and chairs. This is a perfect location for large group gatherings and cook-outs. This land used to be part of a working buffalo ranch. Now Snowflake Ranch offers lodging on 16 acres of prairie and creek. 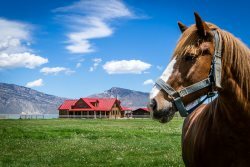 Enjoy the beautiful views of the mountains and prairies; the Beartooth and Absaroka Mountains to the west and north, Big Horns to the east and Heart Mountain to the south. Plan some time to relax and watch the wildlife – ducks, eagles, hawks, rabbits, antelope, white tail and mule deer, coyote and fox. Snowflake Ranch is a place of simple comforts; not fancy, but clean and comfortable. There is no air conditioning. Nights in Wyoming usually cool off nicely so you can enjoy the natural breezes and coolness with open windows. The ranch affords plenty of privacy but there will be management personnel on available should you need anything. **PRICING is based on an occupancy of 10 guests. Additional guests are $10 per person, per day, up to 20 guests. There is also a playroom with a fort,dress-up clothes and toys. Available for use outside: playground with trampoline, swings, etc. Pond with paddleboat, kayak, float tubes and life jackets. Little beach area with sand toys. Garage has some bikes and ride on toys. Lots of space for sleeping bags, outdoor tents, etc. Total Sleeping Capacity: 17 comfortably in beds, 20 Max. Sandi was awesome! Enjoyed working with her and she was helpful with every question we had. Beautiful location, perfect for entertaining, and the sound of Bennett creek is so relaxing as it runs by the living room and bedroom. The kitchen is well stocked with dishes and equipment and the entire place is comfortable and relaxing. The place was beautiful! We didnt get to float bc the creek was too high but the sound of rushing water made me sleep so much better! Loved the home and so did all the kids! We loved the property! Plenty of room for our group of 14. Beds were comfortable. Loved sitting on the patio listening to the creek. Lots of toys and space for the kids to play in. A very wonderful place! The Team was so pleasant to work with anytime I called to ask questions, they were answered. This was one of our favorite vacations ever! The house and property were beyond our expectations. The mountain view from outside was awesome! Such an amazing place to have family gatherings, it was perfect for our family reunion. Everyone who attended the reunion complemented on the whole place. My favorite place was sitting on the back patio in the morning, drinking coffee and listening to the creek flow right in front of my eyes. My family and I will definitely be back! The rooms were beautifully decorated and great beds. All the activities that were supplied for the kids. We had 13 children accompany us on this family trip and they had a blast. From the tree house up stairs, trampoline, water toys, etc. all Kept the kids busy and never a bored moment. There were 15 of us that stayed here and it was just right! Plenty of bathrooms and beds. Loved that there was a washer and dryer! Kids loves the toys in the garage and costumes! This inside of the lodge was gorgeous! Was very impressed w/all the extras! The property contacts were very helpful and friendly. We had a wonderful time together as this was our very first family reunion. Everyone had a wonderful time and enjoyed being out and away from town. It really gave us an opportunity to get caught up and to know each other better. The house was very comfortable and accommodated everyone from young to old. The outside living space was very nice and provided many activities for the children. The creek right next to the house was awesome!!!! Going to sleep at night listening to the water was amazing. Some of our party decided to pitch a tent next to the creek and enjoyed the incredible stars, moon and sounds of nature. We would stay here again in a heart beat! The staff were very helpful, answered all of my questions readily. Our family of 3 adults and 5 children had an excellent time at The Buffalo Lodge. It was exactly as it looked in the pictures. Although it was about 1.5 hours from Yellowstone, the children enjoyed the many different activities right outside the door, so there was never any "boredom." We so very much enjoyed the pond, the firepit, the little creek for wading and tubing, as well as the outside play equipment. The horses to pet were an added bonus for the kids. The Buffalo Lodge had a very well-stocked pantry, plenty of towels/linens for our group (and many more) and was large enough so everyone had plenty of room and/or privacy if they wanted it. I don't think the kids even noticed that there was no TV and only watched a couple of movies on the DVD, most evenings were spent playing lively card games or just simply showering and falling into bed because of the play-filled days. We enjoyed our week there immensely and would recommend this away-from-it-all place to anyone who wants to spend time with family/friends but still have plenty of activities at your doorstep to keep the kids entertained! They were extremely helpful in helping us with our plans. They provided us with all the information that we requested. They called or sent emails to confirm that everything was ready for our stay. It was a great family vacation and we would definitely return for future trips. The property was remarkable for our large group. The owners were quick to respond to our water issue and they were extremely cordial. This property was way beyond anything that we expected. So satisfied and have told many people about our experience. Nightly rates are based on an occupancy of 10. Additional guests will be charged $10/night/guest.